In Christian theology typology is the study of types - prefigurative symbols in Scripture. They can be 1) An actual historical thing or event which, at the time it occurred, was a rough draft or glimpse, of one or more actual events yet to come, although the significance may not have been apparent at the original occurrence. Or 2) A person who prefigured the Messiah in some way. 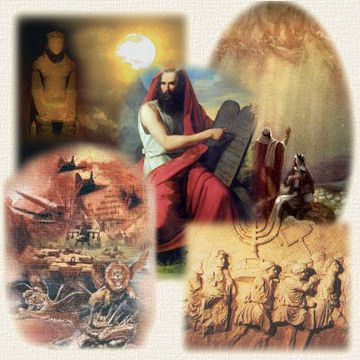 These 'personal' types were in addition to the many specific Old Testament Messianic prophecies. In short, a type was one or more event or person that foreshadowed, pointed to, and culminated in one final and very important event (or person) called the antitype. The most complete description of the Jewish feasts is found in Leviticus 23, each of which have both a historic and prophetic significance. They celebrate a historical event in Israel's past, but also are a prophecy of future events four of which have already come to pass. . it is important to note that the Feasts that symbolize a sequence of events, were given by God in a set chronological order. Therefore the events that they symbolize will take place in the same exact order. I have read way too many interpretations of the Feasts that jump backwards and forwards between them in an effort to make them fit into pre-conceived end time scenarios. What we need to do is make the order of the Feasts our guideline to coming events, instead of scrambling them to fit our ideas. The book of Daniel presents an extraordinary display of prophetic foreknowledge. He foretold, often in great detail, the succession of empires from the reign of Nebuchadnezzar the Babylonian king about 600 B.C. to the Roman Empire which began to come into power around 241 B.C. But that was far from all. Daniel also foresaw far into the future to the reign of the antichrist and the end of the age. Messianic prophecy is not always easy to understand however, in the Holy Scriptures, an array of prophecies which extend over hundreds of years find complete fulfillment in the short thirty-year life span of one person, Jesus of Nazareth, many being fulfilled in one day. For example Psalm 22:16 declares that His hands and feet would be pierced... long before crucifixion was invented as a form of capital punishment by the Persians and a thousand years before it was made common by the Romans. But the question has to be asked... if Old Testament predictions were fulfilled in the life of Jesus why, when we read these prophecies in their original setting, do they often seem more obscure than we might have expected? Is it possible that skeptics of biblical prophecy are right? Could there be validity to their claim that Christians read Jesus back into the Old Testament? Perhaps one of the most fascinating, and compelling, of the prophecies is when Moses declared that God would raise up another Jewish prophet in the future whose life would closely resemble his. A close look at the lives of Moses and Jesus of Nazareth reveals numerous parallels, most of which were well beyond the control of any human . Few passages have provoked such controversy as Isaiah 7:14, generally held by Christians to be one of the greatest Messianic prophecies ever. We tend to assume that the Isaiah passage was solely a prediction of the virgin birth of Jesus. This, however, is impossible since it would mean Isaiah's words had no purpose, nor did they make any sense, until Jesus was actually born some seven centuries later. In actuality, Isaiah's words were not directed at Christ, but at Ahaz, king of the southern kingdom of Judah. So, how and why did Matthew read the birth of Christ into Isaiah's prophecy to king Ahaz. Did he, as critics often claim, quote the prophet's words completely out of context? If God said that his Messiah would be a great political leader, would bring peace to the world, would rebuild the temple and reunite the Jews, then why do Christians believe Jesus was that Messiah? Approximately 2500 prophecies appear in the pages of the Bible, about 2000 of which already have been fulfilled to the letter - no errors. (The remaining 500 or so reach into the future and may be seen unfolding as days go by.) Since the probability for any one of these prophecies having been fulfilled by chance averages less than one in ten (figured very conservatively) and since the prophecies are for the most part independent of one another, the odds for all these prophecies having been fulfilled by chance without error is less than one in 102000 (that is 1 with 2000 zeros written after it)!